On a recent day at the Botanical Garden, children crowded around a skewered boulder, their petite frames pushing and spinning the massive 5-ton rock created by Zachary Coffin. “I love this because it keeps them from climbing on everything else,” said Kim Cresswell, mother to one of the children pushing the stone Coffin pulled from Lithonia. 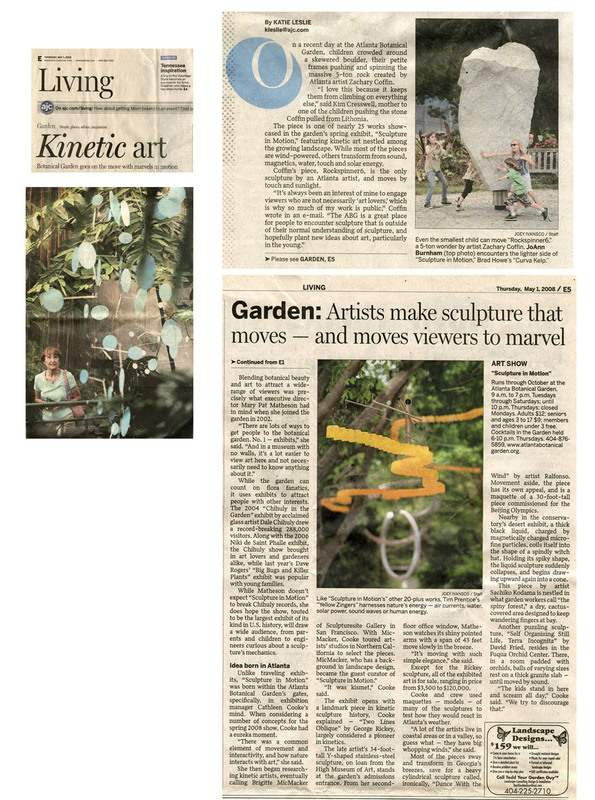 The piece is one of nearly 25 works showcased in the garden’s spring exhibit, “Sculpture in Motion,” featuring kinetic art nestled among the growing landscape. While most of the pieces are wind-powered, others transform from sound, magnetics, water, touch and solar energy. Coffin’s piece, Rockspinner6, is the only sculpture by an Atlanta artist, and moves by touch and sunlight. Blending botanical beauty and art to attract a wide-range of viewers was precisely what executive director Mary Pat Matheson had in mind when she joined the garden in 2002. While the garden can count on flora fanatics, it uses exhibits to attract people with other interests. The 2004 “Chihuly in the Garden” exhibit by acclaimed artist Dale Chihuly drew a record-breaking 288,000 visitors. Along with the 2006 Niki de Saint Phalle exhibit, the Chihuly brought in art lovers and gardeners alike, while last years Dave Rogers’ “Big Bugs and Killer Plants” exhibit was popular with young families. While Matheson doesn’t expect “Sculpture in Motion” to break Chihuly records, she does hope the show, touted to be the largest exhibit of its kind in U.S. history, will draw a wide audience, from parents and children to engineers curious about a sculpture’s mechanics. Unlike traveling exhibits, “Sculpture in Motion” was born within the Atlanta Botanical Garden’s gates, specifically, in exhibition manager Catheleen Cooke’s mind. When considering a number of concepts for the spring 2008 show, Cooke had a eureka moment. “There was a common element of movement and interactivity, and how nature interacts with art,” she said. “It was kismet,” Cooke said. The exhibit opens with a landmark piece in kinetic sculpture history, Cooke explained — “Two Lines Oblique” by George Rickey, largely considered a pioneer in kinetics. The late artist’s 34-foot-tall Y-shaped stainless-steel sculpture, on loan from the High Museum of Art, stands at the garden’s admissions entrance. From her second-floor office window, Matheson watches its shiny pointed arms with a span of 43 feet move slowly in the breeze. “It’s moving with such simple elegance,” she said. Except for the Rickey sculpture, all of the exhibited art is for sale, ranging in price from $3500 to $120,000. Cooke and crew used maquettes — models — of many of the sculptures to test how they would react in Atlanta’s weather. “A lot of artists live in coastal areas or in a valley, so guess what, they have big whopping winds,” she said. Most of the pieces sway and transform in Georgia’s breezes, save for a heavy cylindrical sculpture called, ironically, “Dance With the Wind” by artist Ralfonso. Movement aside, the piece has its own appeal, and is a maquette of a 30-foot-tall piece commissioned for the Beijing Olympics. Nearby in the conservatory’s desert exhibit, a thick black liquid, charged by magnetically charged microfine particles, coils itself into the shape of a spindly witch hat. Holding its spiky shape, the liquid sculpture suddenly collapses, and begins drawing upward again into a cone. This piece by artist Sachiko Kodama is nestled in what garden workers call “the spiny forest,” a dry, cactus-covered area designed to keep wandering fingers at bay. Another puzzling sculpture, “Self Organizing Still Life, Terra Incognita” by David Fried, resides in the Fuqua Orchid Center. There, in a room padded with orchids, balls of varying sizes rest on a thick granite slab — until moved by sand.